I’ve been keen to try dyeing with this weedy species (there are numerous pokes around the world but I’m pretty sure the one found in southern Australia is Phytolacca octandra) since I saw it growing at Werribee Gorge last year. 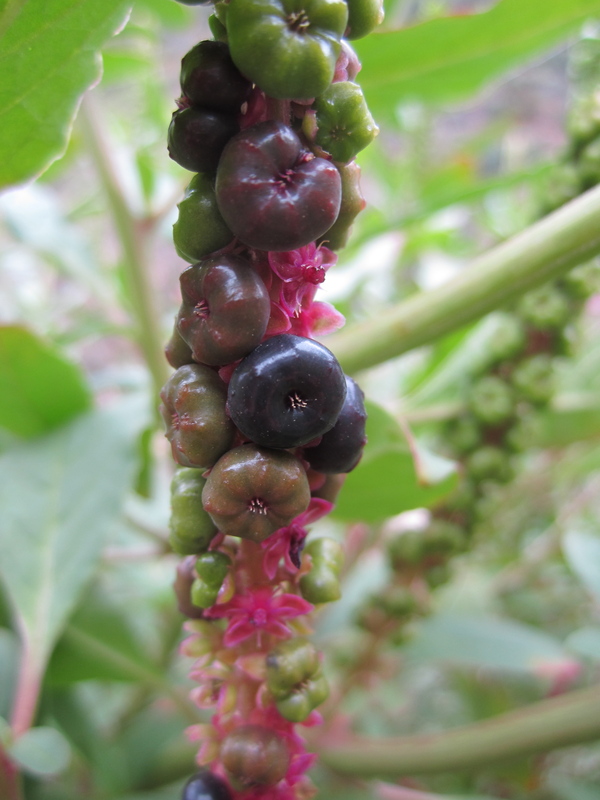 I’d read about it in Rebecca Burgess’ Harvesting colour and know the genus from my herbalist days (Phytolacca decandra is a great lymphatic and glandular remedy) but didn’t think I’d ever get my hands on it until I stumbled on it on a bushwalk. I was kicking myself that I couldn’t get back out to the gorge in time to harvest the ripe berries and then one day found a self-seeded plant in a housing estate around the corner from my house! Apparently dyers have long eyed off the purple-black berries as a dye source (even its names serve to tease- phyto= plant, lacca= red dye, common name Inkplant) but couldn’t get the colour to hold… and then the experiments of natural dyer Carol Lee led to the discovery that the pH of the dyebath must be low (acidic) for the pigment to bond to fibres. Revolutionary! So, temporarily putting aside my greed for usable quantities of dyed yarn (I tend to jump in instead of testing and sampling! ), I picked a small handful of berries and heated them gently while pre-mordanting a small hank of wool/ silk with vinegar according to Rebecca Burgess’ instructions. At first, the dyebath was a lovely dark pink but it slowly got paler and paler until all colour was lost- I added the yarn anyway and simmered it for 45 min… and ended up with a very pale yellow-green, not the dark red I was expecting. 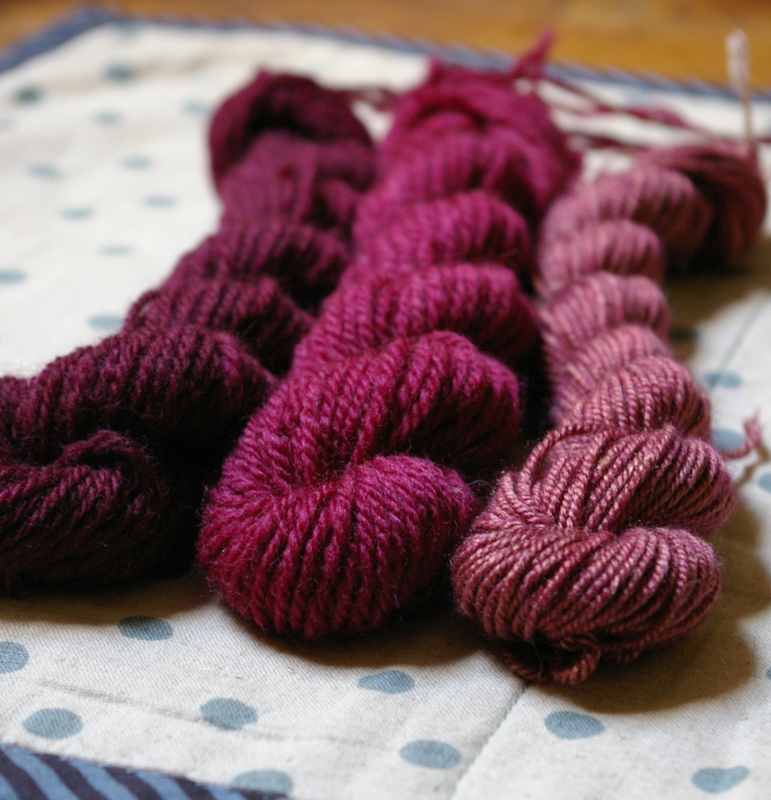 It started me thinking about cold-dyeing instead- it seems like lots of berries and fruit yield clearer and longer-lasting colours that way- and then found that Dre of grackle and sun had done just that and had great results! So I followed her wonderful advice and steeped the berries (and racemes) in 100% vinegar in a large jar for a month and then added the yarn and left the whole thing to soak for another 10 days. 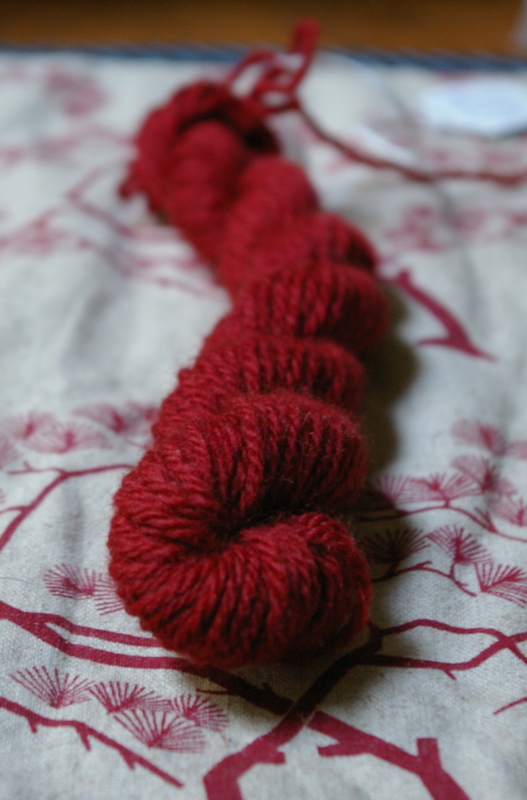 I then removed the skeins, left them to dry and then rinsed them really well to remove the vinegar. I wasn’t sure how leaving yarn in pure vinegar would affect it but it feels fine. I’m incredibly excited to get such amazing colours from a weed with no input except vinegar and time 🙂 The wool/ silk yarn is much paler because only the wool fibres seem to have picked up the colour, even though silk often dyes more readily than wool- another enigma! I was also keen to see how different the colour would be with hot-processing so, once I’d removed the yarn from the jar, I put the remains of the dyebath in a pot with enough water to cover, simmered for 1.5 hours and then added some more vinegar-mordanted yarn, holding the dyebath at 70C for 2 hours as per Rebecca Burgess’ instructions. And the result is quite, quite different. I now need to test them all for light-fastness. I wonder if I’ll get the same results as Dre for this… her work, as well as that of Carol Lee and Rebecca Burgess, has really inspired me to experiment more, whether that be playing around with pH, different methods of dyeing or plants I haven’t tried before. Thankyou! This entry was posted in dyeing, knitting and yarn, plants and tagged dyeing with poke, natural dyeing, phytolacca, plant dyeing, pokeberry, textiles, yarn on June 25, 2013 by admin. Wow wow wow. Wow. Perfect colours! And so impressed with your persistence. Completely gorgeous, Jules! Love the colour variation and incredible depth. Nice one!! Amazing colours! I love to see all your experimentation. wow, your natural dyeing is amazing jules! where do you get the pre-mordanted yarn, or do you pre-mordant it yourself? it’s the mordants that put me off to be honest. 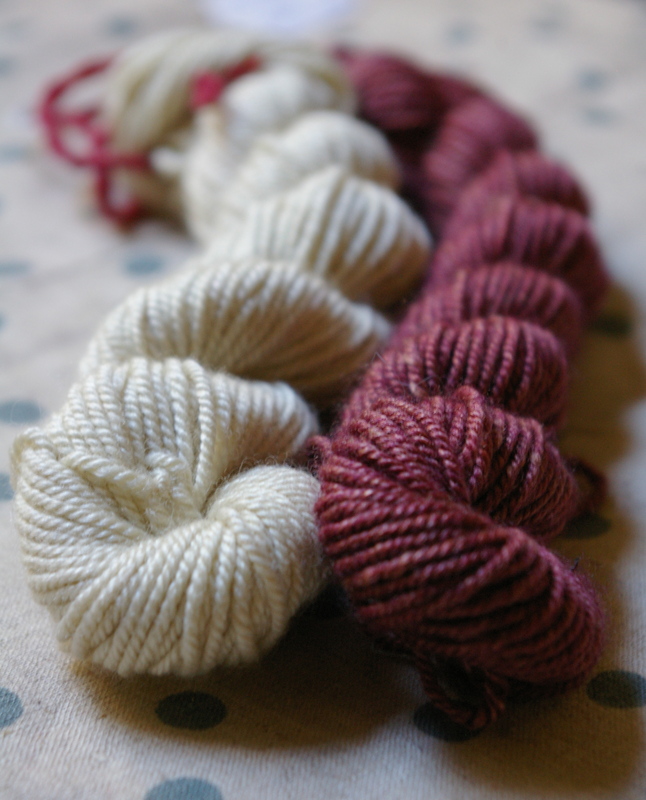 Your posts on natural dyeing are so informative. I am going right through them all. I just wondered what your results for light fastness were on the pokeberry? Did that colour last? Also did you ever try the copper and iron solutions from old pipe and rusty nails?